A mix of rock and sand greeted the Curiosity Rover as it approaches the Bagnold Dune field, the dunes slowly encroaching on weathered outcrops. This is our first visit to active dunes anywhere but on Earth. 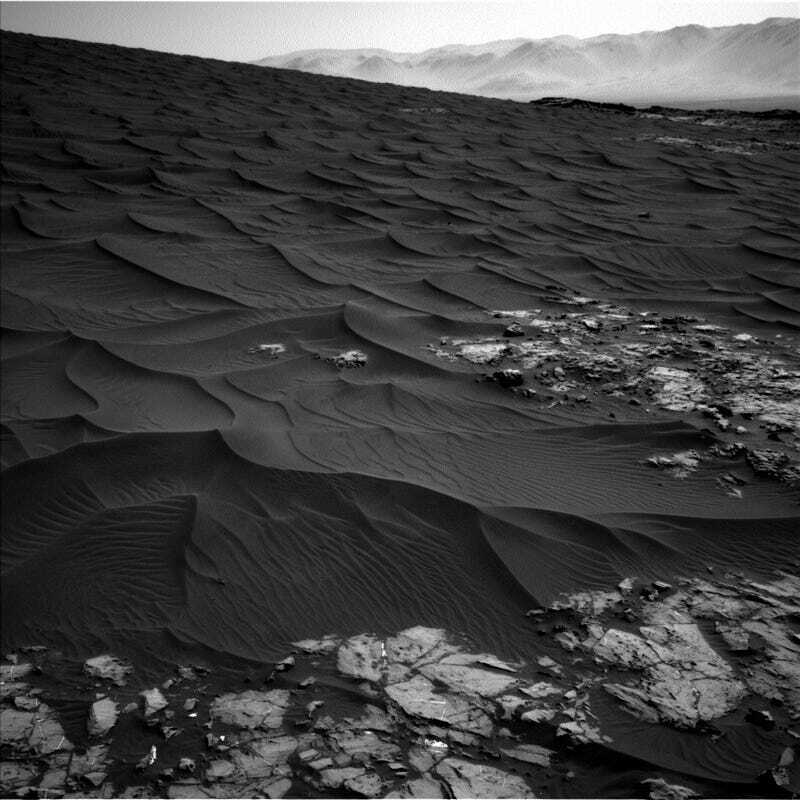 Curiosity is currently taking photos as it inches closer and closer to the dark sands of the Bagnold Dunes. Once it reaches its target dune, it’ll use its scoop to collect a sample for analysis, and sideswipe the sand with a wheel to scuff a fresh surface to ogle the dune’s interior. The position of the Curiosity Rover is marked on the satellite image below, near the center. Interestingly, none of the outcrops share the distinct dark colour that would indicate an easy source for freshly-eroding sediment. The dark Bagnold Dunes are composed at least in part of olivine, a mineral common to dark volcanic rocks (basalt). Researchers are hoping Curiosity will be able to determine if the wind is sorting minerals, separating heavier olivine from other minerals. The Bagnold Dunes are active: satellite images reveal them creeping about a meter (3 feet) per year. This is our first up-close look at Martian sand dunes, in contrast to sand ripples and drifts. Unlike ripples or drifts, dunes have enough sand that the windblow sediments can slide down the steep downwind face. Interesting geological features in this area will be named for Nambian geological place names in a tribute to the Namib Desert that has offered such an excellent terrestrial analogue for interpreting Martian dunes and playas.